Yemen's water problem is not new but it is now so acute that the country is close to running dry. The vast majority of the population has no access to clean water, while state water companies are at risk of bankruptcy. Before the latest round of conflict erupted in March, around half of the country’s 26 million people were reckoned to be using unsafe water. That percentage has now risen to almost 80, or an estimated 20.4 million Yemenis, according to Mahboob Ahmed Bajwa, head of UNICEF’s water and sanitation operations in the country. This is leading to a spike in malnutrition and water-borne diseases, especially in rural areas where buying clean water is often impossible. One of the most water-starved countries in the world, Yemen has long squandered much of its precious resources on cultivating qat, a narcotic plant chewed by most of the population. But the extent of the current problem stems largely from a separate crisis: the massive shortage of fuel. Because Yemen’s water lies deep in the ground, it is impossible for it to be brought up with hand pumps – generators are needed. Since a Saudi Arabian-led coalition began bombing Yemen in March in a bid to force Houthi rebels from power, it has introduced stringent restrictions on ships, leading to desperate fuel shortages. Consequently, much of the country is without power and there is insufficient fuel to power the pumps. Before the fuel shortages, the Sana'a Local Corporation for Water Supply and Sanitation was supplying the capital with 50,000 square metres of water a day from 97 wells. Now, its deputy general director Ashraf Hasan Muaad told IRIN, it is providing just 15,000 square metres from 45 wells. “If the fuel supply improves, the situation will immediately improve,” Bajwa explained. The Saudi-led bombing campaign has also damaged vital infrastructure. “The Saudis shelled the water container in al-Nahdeen, which cost $3,000,000 and was providing water to 30,000 customers, and shelled many wells in the Noqum mountains to the east of Sana’a city,” Muaad said. As the situation has become more desperate, thousands of customers have stopped paying – leaving the state company staring into the financial abyss. Muaad told IRIN it was facing potential bankruptcy. “When the customers stop settling their bills, we won’t be able to pay for the diesel, to pay for the salaries of the staff,” he said. “We were consuming 100,000 liters of diesel before the power cut (the state electricity supply has been largely cut off), but now we need 600,000 litres a month (to power the generators)." Those Yemenis that can afford to, pay for water trucks, but most can’t. At the few mosques that are still giving away water from public fountains, queues snake around the block. The conflict has exacerbated pre-existing trends. Yemen’s water tables have dropped to dangerously low levels in recent years. In the Sana’a region, for example, it has dropped from 30 meters below the surface in the 1970s to up to 1,200 meters, according to some estimates. 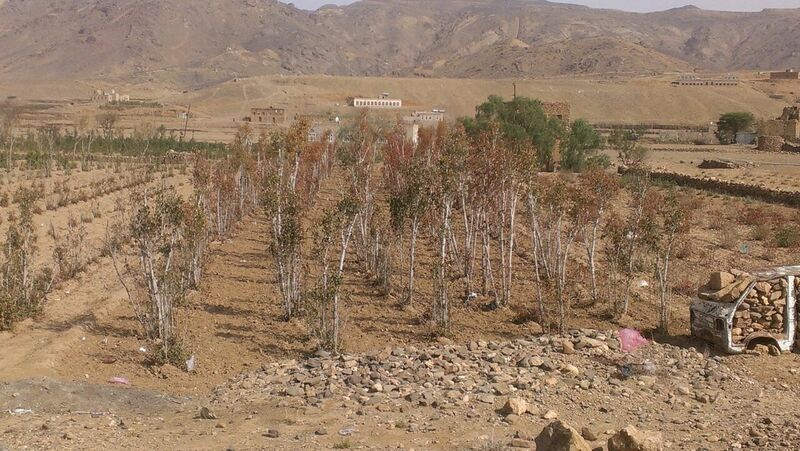 Qat trees – which have mildly addictive leaves that Yemenis like to chew – consume up to 65 percent of the country’s irrigated water. More than a third of Yemen’s total water supplies – some estimates are nearer half – therefore go towards cultivating a plant that feeds no one, in a country where almost 80 percent of the population is using unsafe water. On top of that, Muaad said, the lack of a cohesive government in recent years has encouraged a steady growth in the digging of illegal wells, which has further depleted water resources. The Shahik dam, the largest in Sana’a governorate and the second largest in the country, is now largely empty, as is the Mikhtan dam, which used to provide much of the water for the eastern and northern parts of the region. International NGOs are managing to provide the state with enough diesel to stem the crisis in the capital, but the situation in much of the country, especially in remote rural areas, is unknown. “UNICEF is ensuring supply of water to three million people in 11 cities of Yemen which has [partially] averted displacements from the cities,” Bajwa said. Aid organisations are also helping to provide certain neighbourhoods with 2,000-litre tanks and paying for emergency supplies for the poor and the displaced.